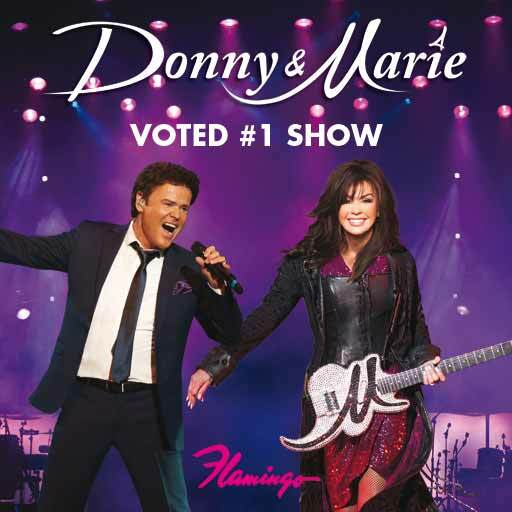 Donny and Marie delight their legions of fans in their residency show at The Flamingo in Las Vegas. 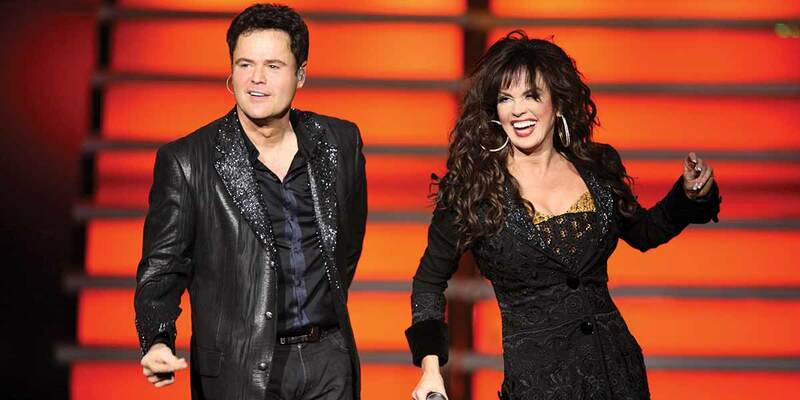 Donny and Marie Osmond have been performing on Las Vegas stages for as long as they’ve been in showbiz. Donny’s very first performance was onstage at The Sahara, opening for Shirley Bassey with his brothers at the wise old age of seven. 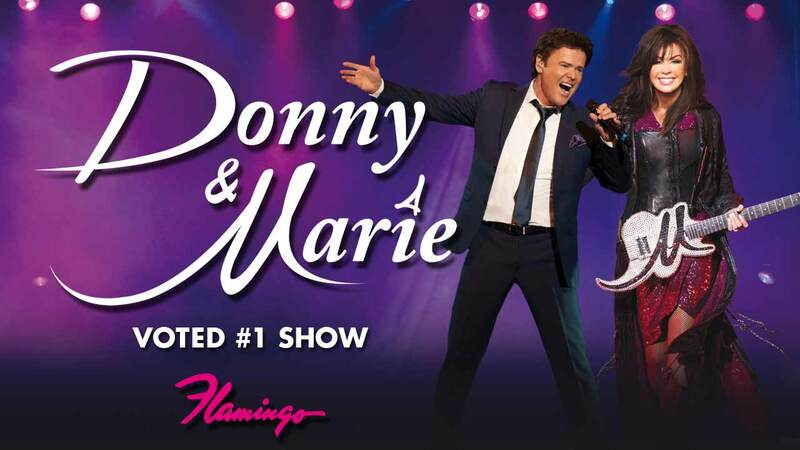 In 1973, Donny sang onstage with Marie for the first time ever at Caesars Palace. Through the rest of the decade, the sibling duo and the rest of the Osmonds played at almost every major showroom in Vegas. Now the little bit country and little bit rock and roll sibling duo are back at The Flamingo for their first Vegas residency in 29 years. Their entertaining new show, which mirrors the format of their classic 70’s variety TV series, showcases their talents for dance, comedy and music, proving how they’ve remained beloved superstars for over three decades. The duo start the show with a few duets, including “I Knew You Were Waiting (For Me),” “The Way You Do the Things You Do” and “Dancing in the Streets,” as well as some playful banter as the siblings tease each other onstage to the delight of fans. After they share the stage for the opening, each sibling gets their own section of the show that highlights their successes as solo artists. Marie takes center stage first, showing off her vocal range by singing solo hits like “Paper Roses,” an energetic cover of The Eurythmics’ “Would I Lie to You” backed by male dancers, a fast-paced medley of Broadway hits and the show-stopping, virtuosic “Pie Jesu.” She keeps things fresh by interacting with the crowd, proving that her quick wit is as perfectly honed as her singing voice. After Marie finishes her little bit country section, Donny emerges for his little bit rock and roll segment, performing his solo smashes like “Soldier of Love,” “Go Away Little Girl” and “Puppy Love,” then launching into a medley of Stevie Wonder hits, including “Ma Cherie Amour” and “I Wish.” Donny keeps the audience laughing as he jokes about his age, yet he doesn’t seem to have lost a beat; he may be a grandfather, but he can still rock with the same energy and enthusiasm that he’s displayed onstage since he was seven. When Donny finishes rocking the crowd, Marie rejoins him onstage to close the show out strong, as the siblings sing together on hits like “Make the World Go Away,” “Morning Side of the Mountain” and “Deep Purple.” Tipping their hat to Marie’s recent run on “Dancing with the Stars,” Donny and the show’s male backup dancers challenge Marie and the female backup dancers to a fun dance-off that gets the crowd charged up. After that, the siblings slow things down a bit with a sentimental video montage of their legendary career and end the show by singing “May Tomorrow Be a Perfect Day,” just like they did to close out every episode of their hit TV show back in the 70’s. The legendary showbiz siblings perform their new resident show in The Flamingo’s intimate 750 seat showroom, which features classic table and booth seating that creates an intimate old-school showbiz vibe. 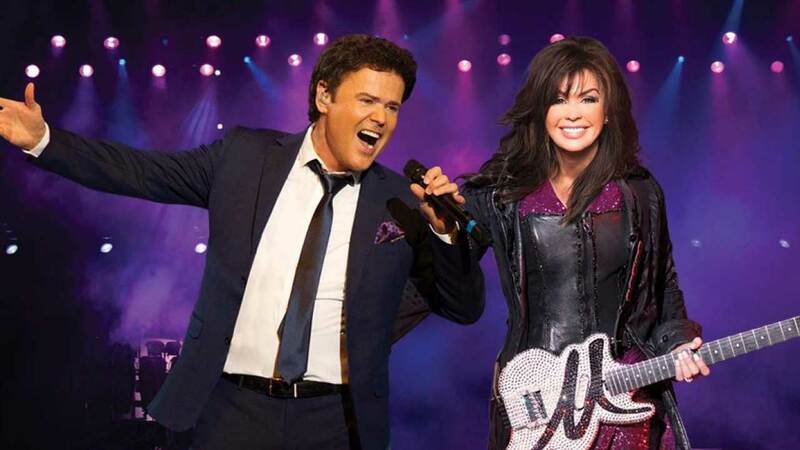 The Donny and Marie Las Vegas show celebrates the iconic sibling duo’s long and storied career as they make their triumphant return to Las Vegas.